These chosen as my next installments in the LOST Book Club. This book (both stories were included in one binding) sat on my nightstand for days before I picked it up to really begin. 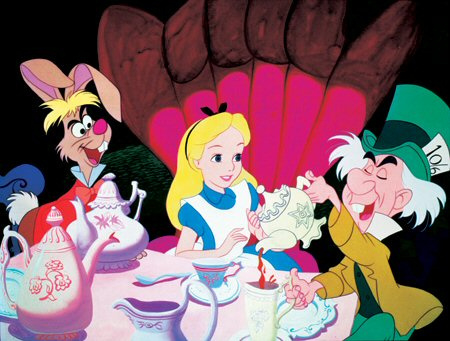 My first impulses caused me to cringe because Alice in Wonderland brought two unpleasant thoughts to my mind: 1) the trippy Disney movie that was impossible to follow as a little girl, and 2) schoolmates chanting “Allison Wonderland” in elementary school. I knew it’s “Children’s Classic” marking meant that it couldn’t all that difficult to get through, but I figured it would most likely be…well, boring. I was pleasantly surprised as I read through the first story, though I don’t believe I’ll run to read it again. To be involved in Alice’s dream world was fun, and I appreciated the ludicrous characters; as a child I remember becoming frustrated and angry with the crazed creatures Alice encounters, but now I just had to smile. Being a former English teacher, I enjoyed the puns and the word plays as well. The story was very inventive and nearly believable; though I knew that Alice had to just be dreaming, I felt as though I could see her adventures. That might have been aided by Disney background, though. All of that said, I found the pursuit of the second story to be rather daunting. Once Wonderland was finished, the book took quite a break before I forced myself to accompany Alice through her Looking Glass. I needed a bit of time to recover from my first acid-induced adventure. The second story was also fairly clever, though I don’t think it had quite the charm as his first novel. It wasn’t different enough from Wonderland for me to be really impressed, and the constant meaningless songs and poems became very mundane for me. I know that each probably possess their own hidden, deeper messages, but I just didn’t care to dissect them. As far as LOST goes, I saw some early connections with Wonderland (Jack chasing his father like Alice chases the White Rabbit…well, maybe just that one), but did not find a whole lot with the Looking Glass (except for the station called “The Looking Glass”; maybe something about the backwards nature of those on the other side of the glass?…). I know there has to be a lot of intricate symbolism that I’ve been too lazy to search for. As an aside, it was quite fun to be reading Wonderland during our recent primaries. While I stood in line to cast my ballot, Alice was experiencing her own caucus race in the novel. Hers went quite a bit faster, though.